Tired of being treated like a second-rate power, Moscow is out to prove it is still boss. How did the situation get to this point? Madonna Gavasheli knows war. She and her family were driven from their homes 15 years ago in one of the many violent spasms that followed the breakup of the Soviet Union. They had just finished building a new brick house after years of careful saving when, last week, their South Ossetian village of Knolevi was pounded again as Russian jets screamed overhead and artillery erupted from the surrounding hills. Gavasheli, 29, cowered in the basement through the night, clinging to her two young children. At dawn they joined a column of thousands of people heading for Tbilisi, Georgia's capital. When they arrived in the city hours later, they staggered into an abandoned kindergarten with scores of other refugees. Back in the village, her husband had vanished, along with their house. "There were many, many bombs," says Gavasheli, stunned at how her life has been transformed again. "I do not even know how I got here." She's not the only one. The short but brutal war between Georgia and Russia has left Georgia's military battered and its countryside scorched by bombs and tank fire. The fighting  which officially ended on Aug. 12 when Russia agreed to sign a U.S.- and European-drafted cease-fire but threatened to reignite the next day as Russian troops were slow to withdraw  has left at least 1,000 dead and injured and has forced tens of thousands of Georgians and ethnic Russians living in South Ossetia to flee their homes. But beyond the human carnage, the conflict has also demonstrated just how far a resurgent Russia will go to protect its interests. It is a scenario very different from that envisioned by the West when the Soviet Union collapsed nearly 20 years ago. Then, the blueprint for a post-Soviet world involved a weakened Russia that would befriend the West, and former Soviet states that would thrive as democracies. Instead, awash with profits from its natural resources, Russia has emerged as a new economic power, ready to reassert its primacy in its neighborhood and stand up to the U.S. and Europe as a major geopolitical player. Prime Minister Vladimir Putin  who, despite stepping down as President in May, continues to run Russia through his handpicked successor, Dmitri Medvedev  invested heavily to turn Russia's debilitated military into a more modern fighting machine. The invasion of Georgia shatters any lingering notion of a weak Russia. "Sure, Russia has lost the information war in the West, and people in America may think that Russia is an aggressor," says Vladimir Pribylovsky, president of the Panorama Information and Research Center, a Moscow think tank. "But Russia is a huge energy supplier. And words do not really matter." Long-running tensions boiled over in early August amid the mountains and farmlands of South Ossetia, a tiny enclave in Georgia that has had a separatist government since 1992. Russia has long maintained a presence in South Ossetia, as well as in Georgia's other breakaway territory of Abkhazia. A senior U.S. State Department official told TIME that, over the years, Russia's military has secured a strong foothold within South Ossetia's government. "The South Ossetians are led by a lot of Russian officers," he says. "There are FSB [Russian intelligence] officers in the South Ossetian so-called government." For weeks before the war, Russian planes circled the skies above Georgia, provoking Tbilisi to threaten to shoot them down. Last month, Russia began annual military exercises close to South Ossetia's northern border, while Georgia moved its own troops up from the south in a mutual "game of chicken," says Charles Kupchan, a senior fellow at the Council on Foreign Relations in Washington and an adviser to U.S. Presidential nominee Barack Obama. The game turned deadly on Aug. 7. Three days after Russia accused Georgian artillery and snipers of killing six people in the territory, Georgian President Mikheil Saakashvili ordered tanks into the capital Tskhinvali. Russian forces invaded soon after. As Putin, George Bush and other leaders converged in Beijing for the opening ceremony of the Olympics, more ominous fireworks exploded half a world away. But conditions for conflict had been brewing for years. Russian officials have long felt their views were ignored by Washington and Brussels, and anger flared last February when Kosovo declared itself independent from Russian ally Serbia, immediately gaining recognition from Bush and most European leaders. "Russia warned that there would be repercussions for Kosovo. And here they are," says Magdalena Frichova, former Caucasus project director for the International Crisis Group. In April, when NATO leaders agreed to consider Ukraine and Georgia as members of their alliance, Russia was further infuriated, seeing this as a direct threat along its borders. With U.S. troops mired in Iraq and Afghanistan, Russia made its move. The result was a foregone conclusion. Three days after Georgia's tanks rolled into Tskhinvali, its forces retreated like a pack of wounded animals. Along the road to Tbilisi, military trucks sat abandoned with blown-out tires and shell-pocked panels. As some 35,000 South Ossetians fled, cars jammed the mountain passes leading out of the war zone. Thousands more scrambled out of Gori, the Georgian town closest to the South Ossetian border, where Georgian troops had gathered. Russian aerial attacks on Gori hit civilian targets, including an apartment building, killing about 60 people, according to the Georgian government. Teimnraz Khizanishvili, 63, was tending cattle near his village on the second day of the war when an artillery shell exploded, killing his friend and his friend's son, who had been standing a few meters from him. 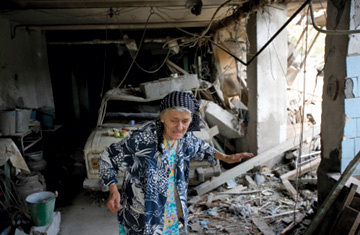 Lying in traction in a Tbilisi hospital, Khizanishvili can scarcely remember what happened. Rasping in pain, he says: "All I want is peace." Where Did the West Go Wrong? European and U.S. officials had worried about renewed conflict in the Caucasus for months. Lithuanian officials warned their E.U. colleagues earlier this year that a Georgian-Russian war could erupt, though they thought it would explode in Abkhazia, where separatists claimed to have shot down two Georgian drones in May. But their warning was ignored, and no high-level meeting was convened to coordinate Europe's response with Washington. Meanwhile, according to a senior official at the U.S. State Department, Washington had grown alarmed by Saakashvili's misguided belief that his small country could take on the Russian military. Hours before Georgian tanks entered South Ossetia, this official says he called Georgia's Foreign Minister, warning her that Russia was drawing Georgia into a trap, and urging her not to take the bait. He recalls saying: "The Russians are looking for an excuse to kill Georgians."